The 2017 Surly Troll is designed to take you to every corner of the world. This no-fuss 26-inch touring bike has provision for racks, fenders, disc brakes, v-brakes, cantilever brakes, derailleur gearing, Rohloff gearing, singlespeed, cargo cages, panniers or bikepacking bags. You can run it with road handlebars, flat handlebars or any kind of alt handlebar. It’s the most versatile touring bike you can buy. The fork is no longer suspension-corrected (ie. it’s shorter), and the head tube lengths have been lengthened to accommodate this change. This is presumably because most Troll owners tend not to use suspension – it kind of goes against the ethos of this bike anyway. The side benefit of this change is that the frame now has more space for a larger frame bag. A new chainstay design permits 26×3.0″ tyres for when the terrain suits. The revised dropouts help give you the choice to run any mountain bike hub: 135x9mm, 142x12mm or 148x12mm. Yep, the Troll really is the king of versatility! There are more braze-ons than ever on the 2017 Surly Troll. The fork alone has multiple 3-boss cargo cages on either side, plus provision for a 24-pack porteur-style front tray and standard lowrider rack. The frame now has two 3-boss cargo mounts on the down tube too. As the 2017 Surly Troll is an offroad touring bike, it comes stock with gearing to match. 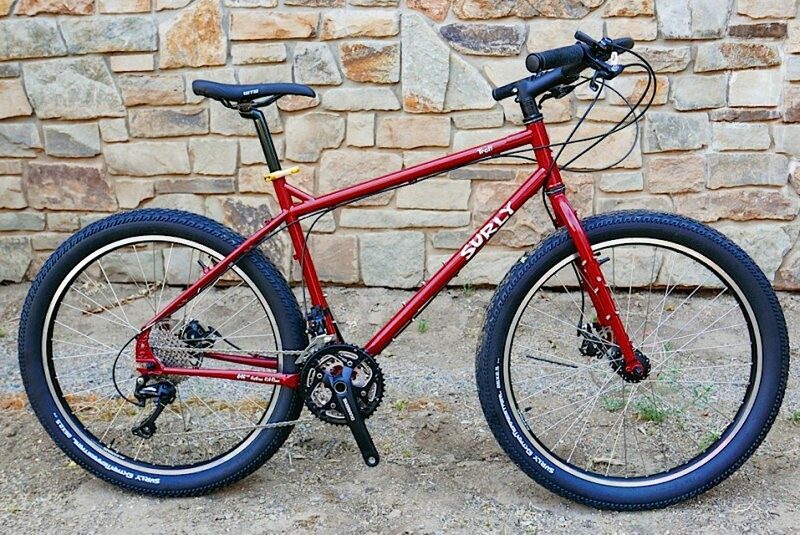 With a 19 gear inch low gear the Troll will take you up dirt roads with the steepest gradients. The 48×11 big gear will allow you to pedal along comfortably at 50km/h (30mp/h) if you need to. It’s an ideal groupset for the versatile bike that it is. 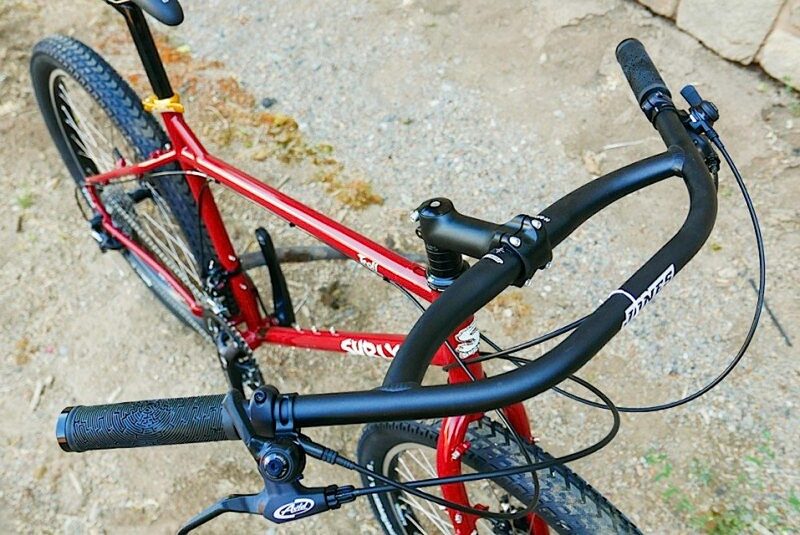 Surly have spec’d the Troll with the Jones Loop bar which is really gaining in popularity within touring circles. 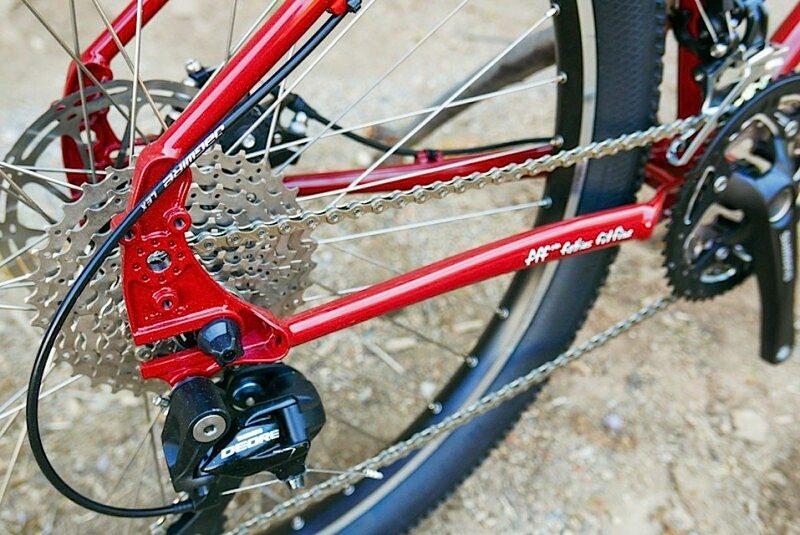 Microshift 10-speed thumb shifters have been used to pare back the complexity of the bike, same with the Avid cable disc brakes chosen over more commonly used hydraulic systems. 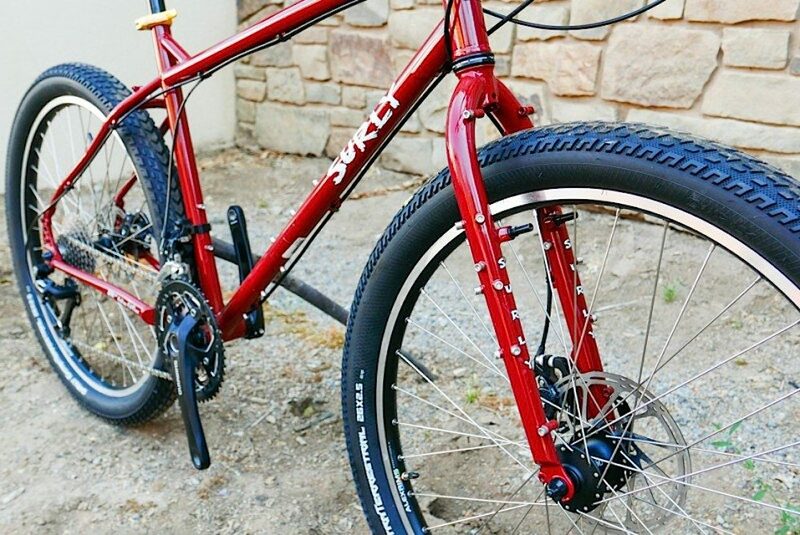 The Surly Troll still uses 26-inch wheels and Surly’s own 2.5″ Extraterrestrial tyres. Surly’s reason for this is simple: 26-inch tyres, tubes and rims are still the most commonly found size in developing regions of the world. I’ve personally found that 26″ wheels are just as quick as 700c wheels in most situations too, despite what the marketing may tell you. 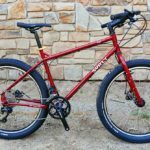 The 2017 Surly Troll will cost you US $1649 and will be available in November/December 2016.